To mix so many ingredients you will need a large, resistant and firm bowl. Hang in your kitchen this beautiful talavera clock, so it looks very Mexican. Although it seems inconceivable to think of a ceviche that doesn’t have fish or shellfish of any kind. The reality is that the vegetarian ceviche also exists and the curious thing about this recipe, is that it gives the same sensation of being eating a fish ceviche . The secret recipe or rather the magic ingredient is the “champignon". That is the ingredient that is used to substitute the fish and it really does a very good job. In this ceviche what is got is a type of fresh and light salad ; excellent for the sunny days. In this recipe many ingredients are mixed therefore the ceviche’s flavor can be considered very diverse – and it can be served as appetizer with a guacamole or even as main course with a white rice. Anybody can prepare this recipe as only ingredients have to be cut and mix. We recommend using red onion in this ceviche because it gives a touch to the mixture that is fresher and crispy. The recipe is given with 1 serrano pepper but it is to taste, depending on how spicy you want the ceviche. Preferably use extra virgin olive oil in the ceviche so it will have a better flavor. It takes approximately 10 minutes to prepare this recipe. This recipe is for 4 ceviche cups. Cut into small chunks the mushrooms that were cleaned, then put them in a bowl and reserve. Dice 1 avocado and 2 tomatoes; then pass them to the bowl and reserve. Finely chop 1/2 red onion, 1 serrano pepper and 3 coriander sprigs. Upon completion pass these ingredients to the bowl and reserve. If you want your ceviche to be milder, remove the seeds and the veins of the serrano pepper. Pour the mixture that was beaten in the bowl over the other bowl, where the ingredients that were cut are. Mix very well the vegetarian ceviche with a mixing spatula. If you have time you can leave the ceviche resting for about 15 minutes so the flavors integrate. 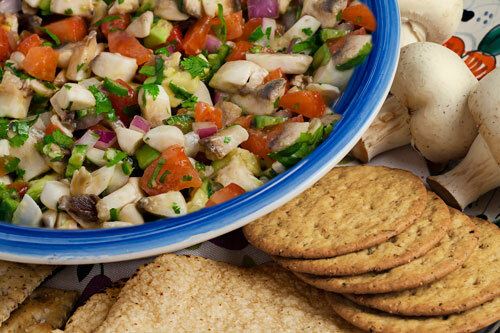 Tip: At the moment of serving the ceviche it can be garnished with tortilla chips or crackers. Variations: The ceviche can also be prepared with shrimp or octopus.